During breast augmentation the surgeon tore an entire bundle of nerves. I was in terrible pain for 6 years. It subsided, but never fully went away. In the 16 years of undiagnosed rupture I had multiple issues which caused acute pain, including acute inflammation and infection (to name only a couple). Since explant, due to residual silicone that couldn’t be removed, enlarged silicone-filled lymph nodes, dilated ducts, and other destructive changes within my chest wall, the pain has not gone away. 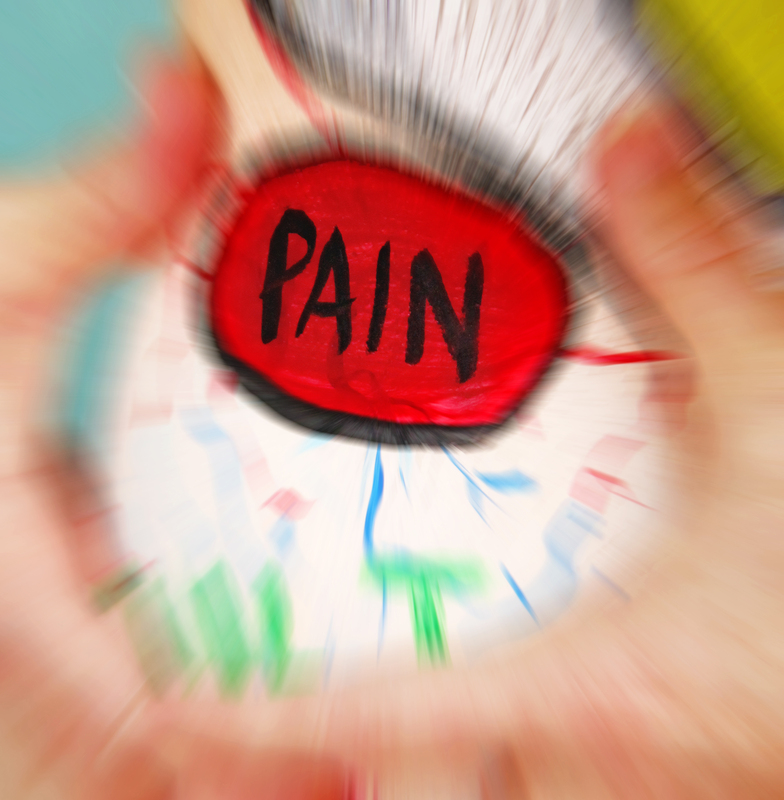 I am in constant acute pain that is unrelenting and exhausting. Pain is very common for women with breast implants, and unfortunately for many pain issues are not fully resolved with explant. I come in peace. I come to be a bridge. I come to make things better for all. But, I will come … only death will silence me. My health is irrevocably damaged, my quality of life poor due to 16 years of undiagnosed rupture. IF rupture had been diagnosed earlier my outcome would have been very different. My explant surgeon stated my prognosis is poor. I hoped that if my situation could be the learning curve and prevent other women from this nightmare then I would be at least glad of that. I hoped it would make a difference for women with implants locally. 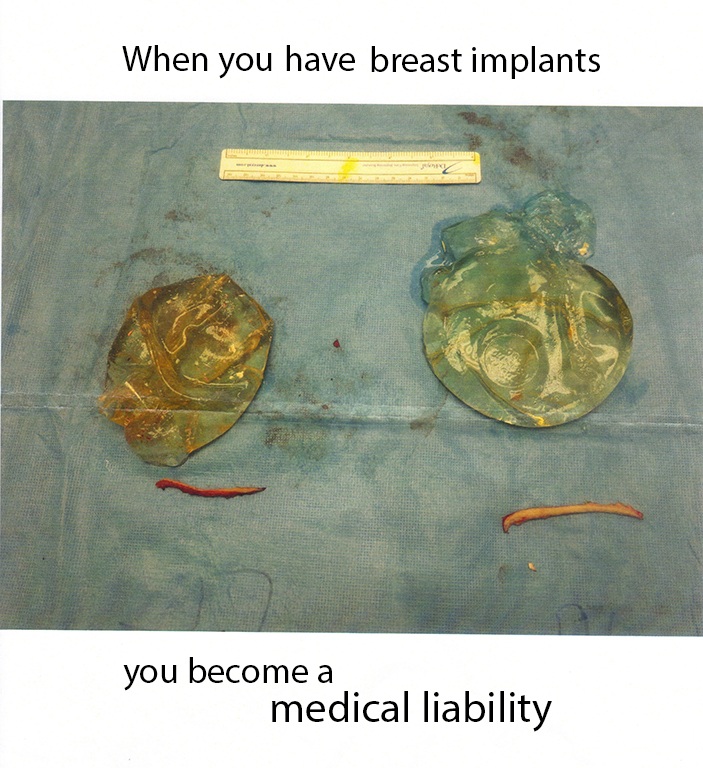 When a regional surgeon told me he would not proactively screen women with breast implants for possible complications or rupture, even if they presented with symptoms consistent with it, due to possible liability issues, stating that they should not expect care here, my blood curdled and I felt assaulted knowing my rupture had been ignored, my life and my worth devalued because I was perceived a medical liability. And similarly for other women with breast implants in this region. I had already committed to using the remaining time I have left on this planet to advocate the truth of breast implants, and this leaves me all the more committed. Yesterday, speaking with a regional surgeon, I expressed it is my hope that through my experience of having undiagnosed rupture for 16 years doctors here would learn from it. I said that I hoped when a woman with breast implants presents with symptoms that could suggest rupture, or other complications, that they would order an ultrasound or MRI. His response was quick. He adamantly stated he would NOT do that. His reason being that if he ordered a test it would be leaving him open to culpability. So, as was done with me, he would continue to pretend he’d seen nothing and do nothing. He stated that women don’t get breast implants here and should not expect care here. That if they get breast implants they’d better be informed themselves prior to getting them. He said he knows nothing about breast implants and has no intention of learning anything about them. Women may not be implanted in Northwestern British Columbia, but they DO get referrals to plastic surgeons, for breast augmentation, through regional doctors. 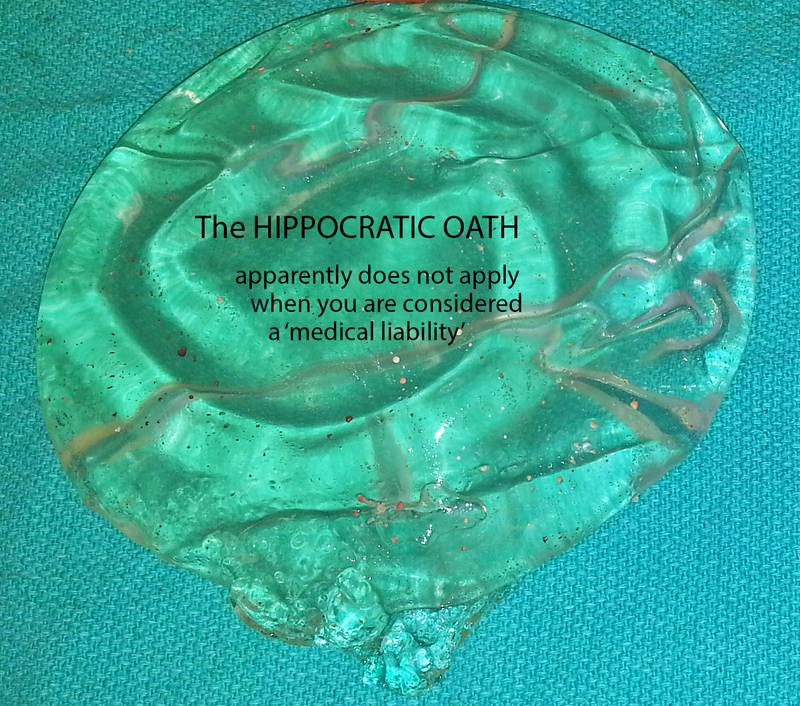 You are on your own medically – YOU MUST BE PROACTIVE! Request an ultrasound or MRI. If you’re refused remind the doctor that FDA and manufacturer guidelines recommend MRI 3-years after augmentation and every 2-years subsequently. Anyone with questions or concerns is welcome to contact me. Today there was a ‘nurse-in’ protest, in Maple Ridge, B.C. as a result of a woman being told to ‘cover up’, while nursing her infant in a restaurant. Breasts nourish life. It is a violation of human rights to be denied the right to breast feed in a public place, in British Columbia. Not to take away from that very important issue, I would be remiss not to bring attention to the issue of self-esteem, and the insecurities that often occur for women after having breast fed because of the pressure to fit a totally unrealistic image. I wondered how many of the women who took part in the protest may later at least consider getting breast implants because they’re unsatisfied with their breasts after nursing. Some may already have them. Nursing babies is a natural part of life; changes in breasts after nursing is also a natural part of life. What if in our culture we valued the beauty of breasts that have softened, sagged, and lost volume after nursing a baby? How is it that a toxic plastic sac is considered a more desirable option? So many women who have their breasts augmented after breast feeding end up regretting it, and wish in retrospect that they’d accepted themselves instead. The Celebrate Your Breasts Project promotes women loving and accepting themselves at all ages, in all stages of life, including after having nursed babies.